Is there a better alternative to photo? Is photo really the best app in Image Editing category? Will photo work good on macOS 10.13.4? 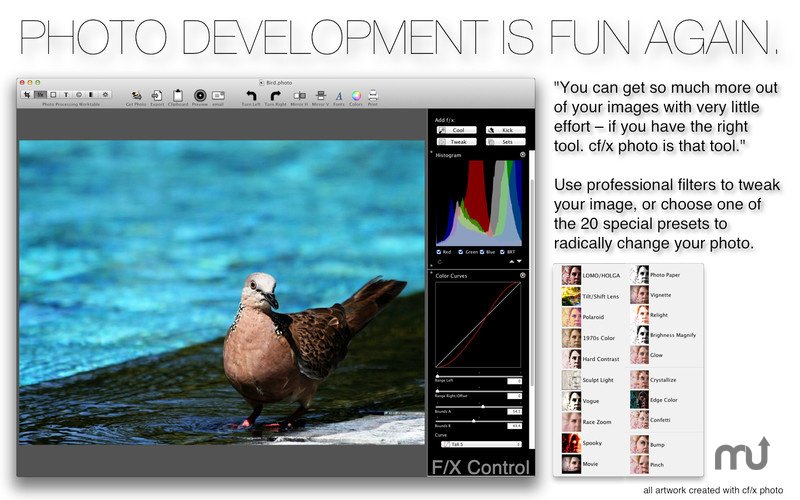 cf/x photo helps you to take back control of your digital images. Digital photography has great impact on the way we use and view photographs. Today, shooting a picture costs next to nothing, and as a consequence we have lots, and lots of them. We all use photo management software (iPhoto/Aperture) to get a handle on our steadily growing mountain of images. But with a growing image collection comes a new challenge: photo management software is great at retrieving images for you. But your images, great in numbers as they are, remain diamonds in the rough. And here is where cf/x photo comes in: it has a simple user-friendly user interface that guides you through the process of polishing up your photos and perfecting them.